Fukuchan already closed on October 6th, 2018. They had been there for 35 years. I was really shocked by the fact that Fukuchan is not already there in Tsukiji. 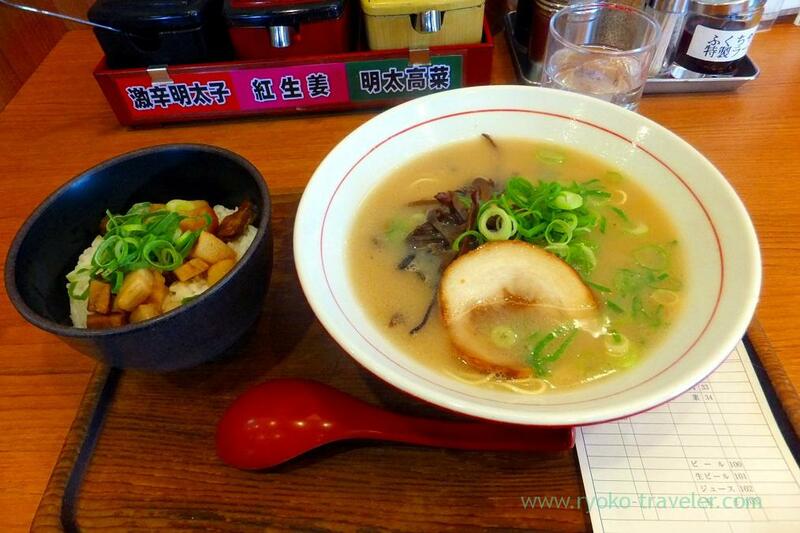 Now there’re many ramen shops in Tsukiji area. 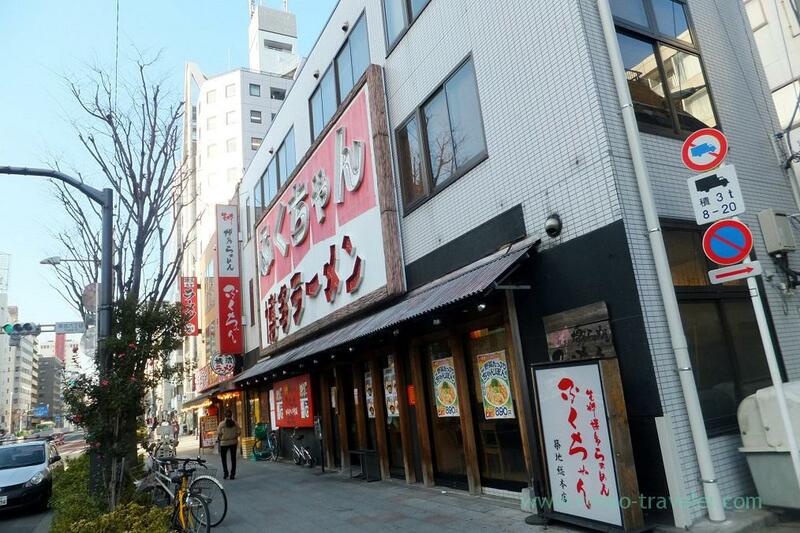 Fuku-chan is Hakata-style ramen shop managed by “Kanefuku” that is one of the most popular Hakata Mentaiko producing company. Fukuchan have been there since 1984. Yes. “Fuku” in the name “Fukuchan” is Kane”Fuku”‘s. We feel their long history by this faded appearance. They are located along big Harumi street. And the signboard of Fukuchan is really outstanding. So, I think you never miss it. There’re counter seats and tables on the 1F and 2F. So, Fukuchan is larger than another ramen shops. Recently each ramen shops are really narrow. The photo is on 2F. There are tables having four chairs each. 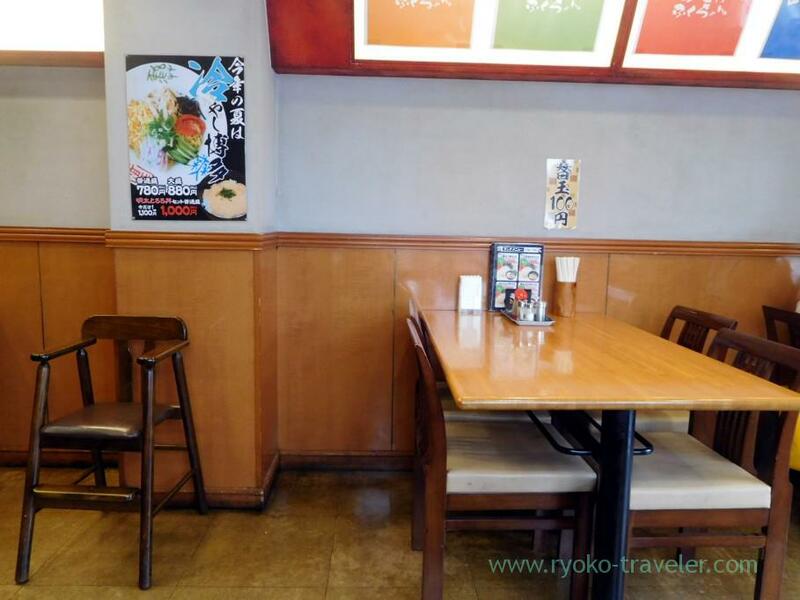 And they serve many dishes as ramen shop and we can use this shop as izakaya with some people. Both ramen and rice is too much ? No. The amount of noodles at the shop is not much. So, though you know I’m small eater, I can eat them up. What the most attract me is… this. 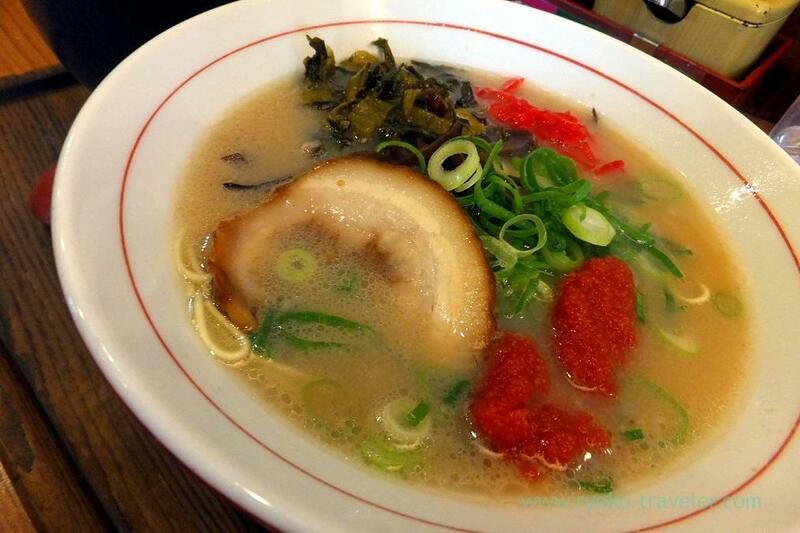 Karashi Takana, red ginger and extremely spicy mentaiko is on each table and we can put them into our soup as we like ! 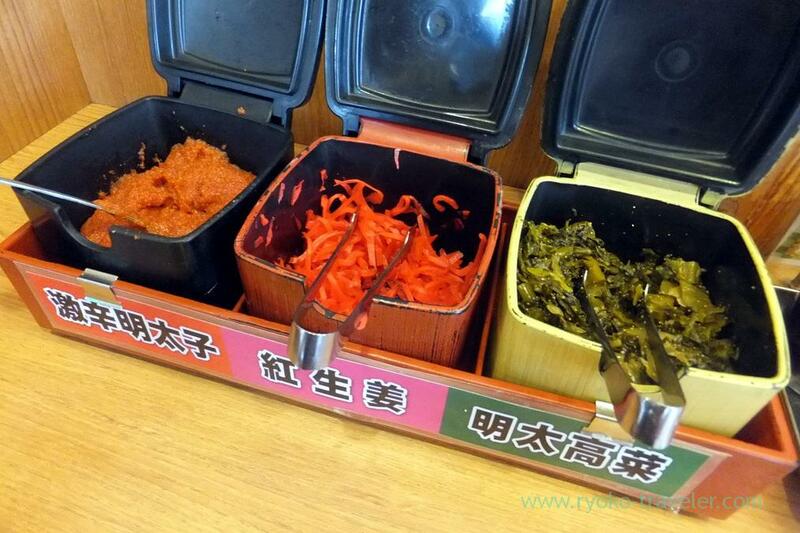 * Karashi takana is pickled leaf mustard in spicy seasonings. 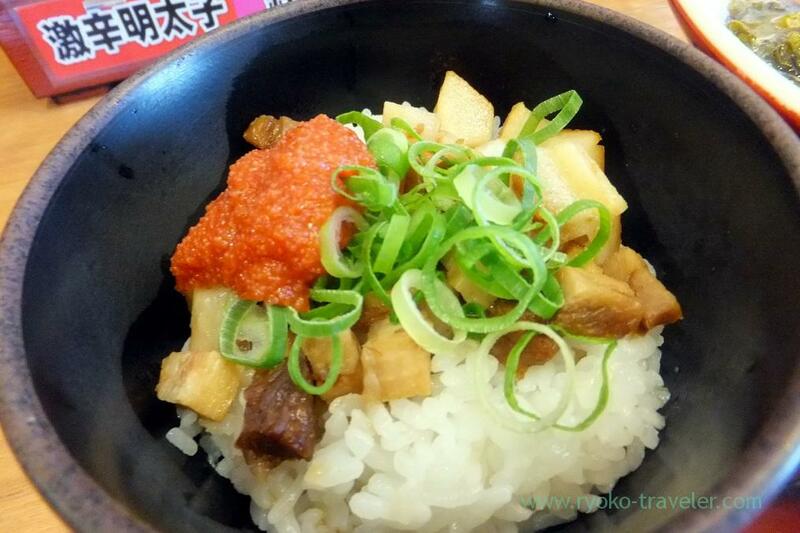 You can eat Kanefuku’s delicious mentaiko as many as you want ! People who love mentaiko cannot unconcern them ! Me, too ! 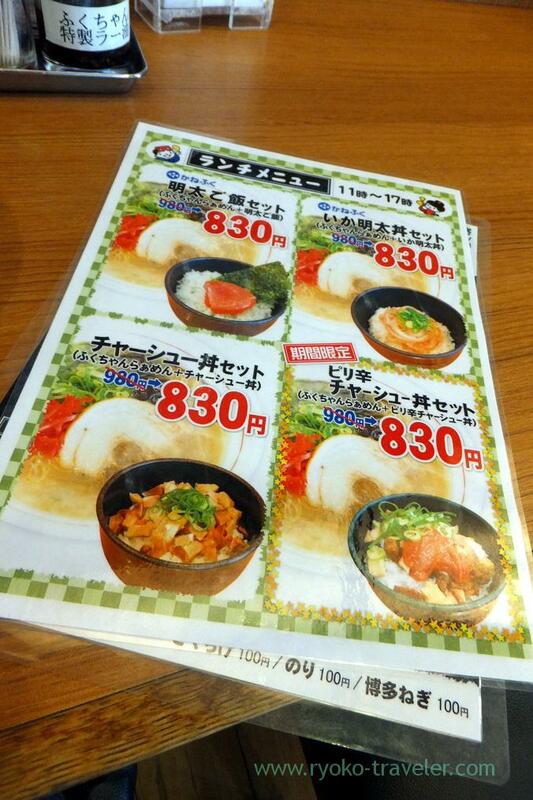 So,,, I ordered Fuku-chan ramen and roast pork bowl set (チャーシュー丼セット, 830 yen). 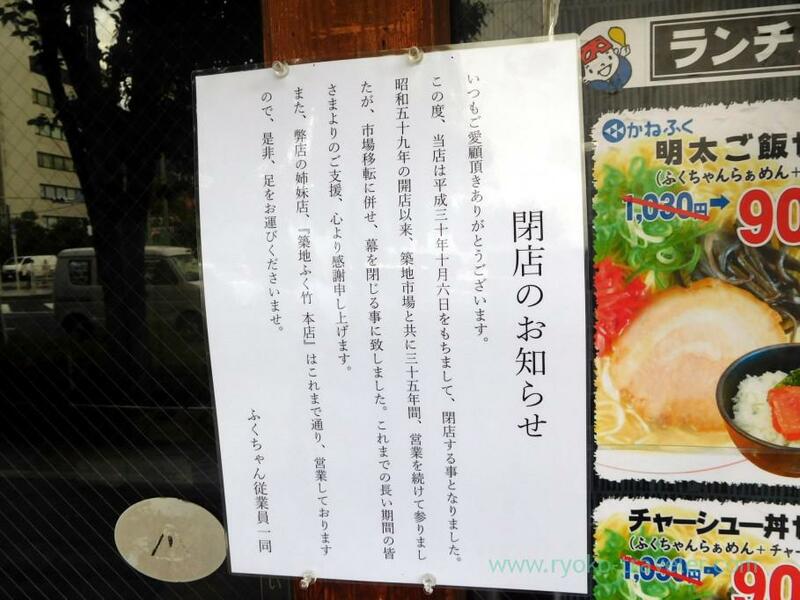 I think their ramen is enough good without mentaiko. 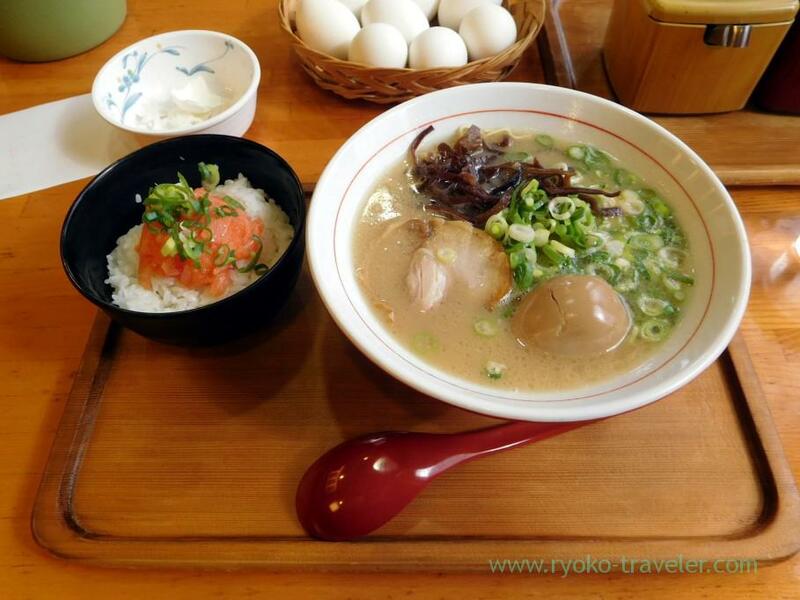 But this tonkotsu soup is common, light and smooth. I think they cook it suitable for all people. 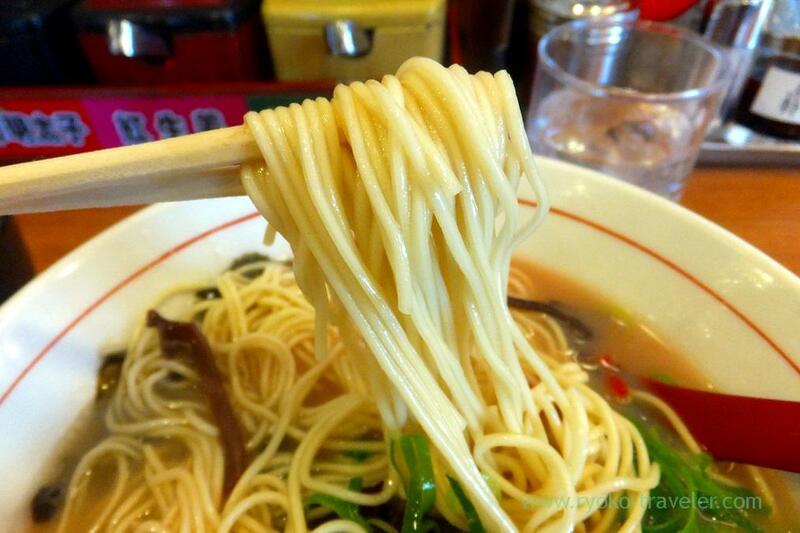 Actually, some people who don’t like tonkotsu ramen like it. To tell the truth, I don’t like fatty tonkotsu ramen. 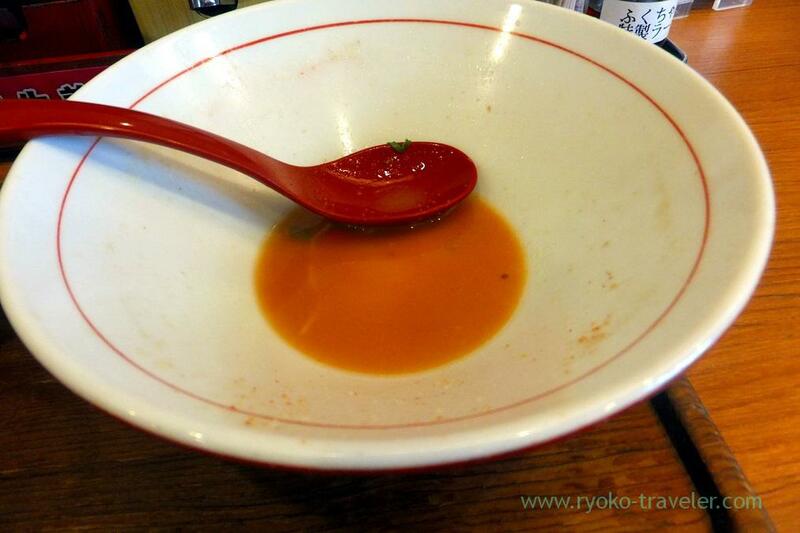 But I like their soup without mentaiko. But it’s not complete for me all the same. Let’s complete. We can make ideal soup with condiments and seasonings on the table. Of course, I put much mentaiko into the soup. 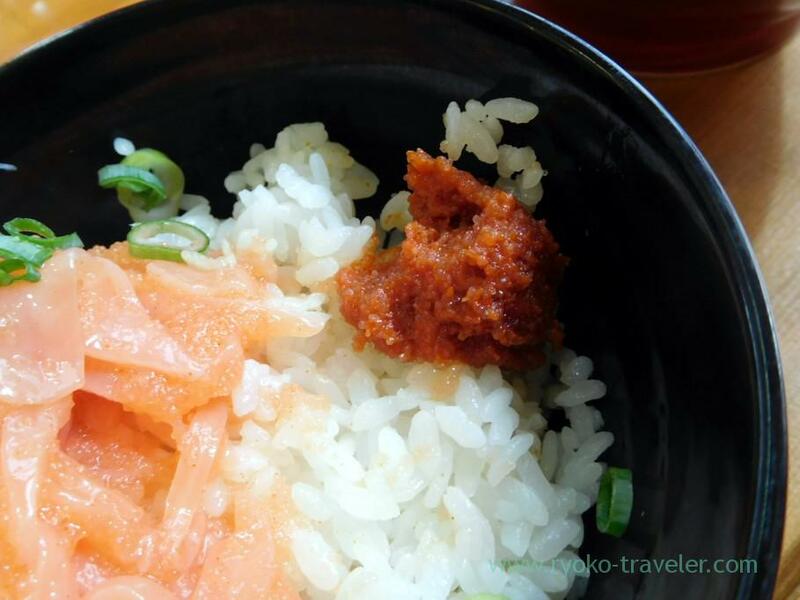 Of course, I put much mentaiko onto the rice, too ! It is unbearable right ! 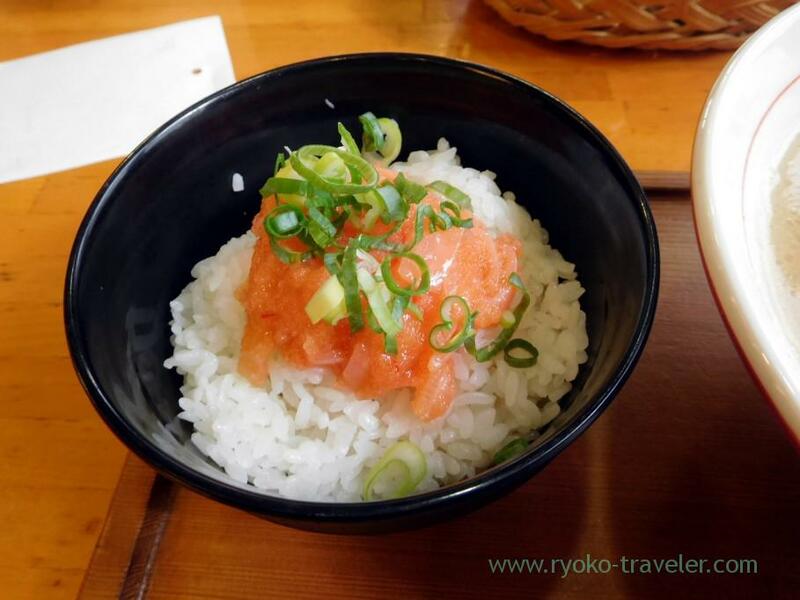 Narrow noodles have lightly flour’s smell.And the noodles dressed with mentaiko is delicious ! it gave tingling feeling in my mouth ! The toppings are jew’s ear, roast pork and green onions. Simple. By the way, I love Squid dressed with mentaiko bowl is my tastes. I love it better than roast pork bowl. And of course, I need additional mentaiko for it, too! 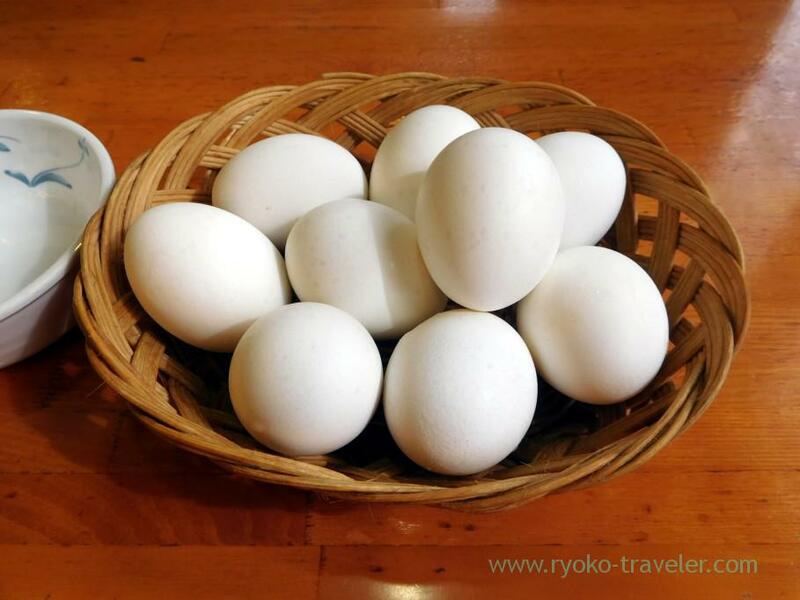 When the day having “0” or “5” (5, 10, 15, 20, 25, 30), they put boiled egg on each tables. You can have it as many as you want. Open / 11 a.m. – 11 p.m.